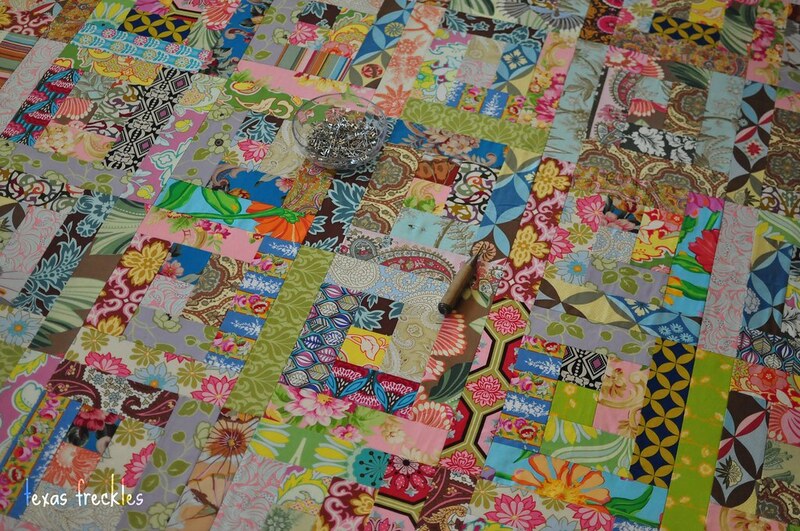 My blog reader was filled with photos of lovely quilts this morning as part of Amy's Blogger's Quilt Festival. I'm going to have to go back through Amy's list one at a time to see them all! I've decided to share my scrappy log cabin. I don't think it's the prettiest quilt I've made, but it's the one that gets the most use around here and I love that it's constantly fulfilling it's purpose. I started on this quilt in February 2009. It was started in one house and finished in another. It began on one sewing machine and was finished on another. It was supposed to be queen size, but it ended up a few inches shy of a twin. It's the largest quilt I've free motion quilted (69 x 82.5") and the first quilt I finished for myself. My inspiration was a scrappy quilt at my grandmother's house. I actually have that lovely scrappy quilt now, but it's in storage so I can't show it to you. It's crazy bright and scrappy and was "loved" by many grandkids over the years. I originally sewed this quilt together without sashing because I wanted that crazy, over-the-top scrappy feeling, but it was just too busy. After it was about half pin basted, I took all the safety pins out and picked all the blocks apart. I'm so glad I did. I like it so much better with sashing. I used a number of Amy Butler fabrics from Ginger Bliss and Charm. In most cases, I used every scrap I had of these fabrics. It also contains fabrics re-purposed from some pillowcases bought at Zara Home and Habitat in London. The back is a busy patchwork. It's been on a couple of picnics and has been used in the yard many times. I don't worry about grass stains on the back. It's seen the inside of a washing machine a few times already. But this is why I love this quilt so much. It usually lives folded over the arm of the sofa. It's big enough for my family of three to snuggle under while watching a movie. It's the quilt my daughter sleeps under when she's sick and sleeps downstairs on the sofa (like last night). If we forget to fold it and it's left crumpled on the sofa, it's where my 13 year old Yorkies cuddle up. I can't wait until I have to repair this quilt someday because of years of use. It's fulfilling it's purpose. There's nothing better than a well-loved and well-used quilt:) The colors in this are great, and the sashing really does make it! Great quilt, love the bright scrappy look! Thank you for sharing your quilt! Everything you make is gorgeous...but I can't believe that you picked every block apart. But you're right, I love the look with the sashing. Beautiful! I agree with your decision; the sashing really makes it! This is SO beautiful! I love the fabrics you used. The sashing really sets this quilt off. Congratulations on finishing it yourself....that is quite a job! It's awesome, and has so much history in it already! this quilt is so pretty! i can't believe you pieced all of those squares together and then took them all apart! i do agree with you though, the sashing is really great with the scappy blocks. What a gorgeous quilt! I love the explosion of colors it offers in between the nice white sashing. I bet you used a lot of scraps on this project. I especially love the feeling this quilt gives you when you see it in action! I love this quilt! The white sashing works so well. This is one of my favourites so far! Mel, that is a great quilt, and really, the best quilts are the ones that get used to bits. Thank you for sharing it with us! Very pretty! I can't believe you took all those blocks apart, wow. You've just described the whole reason why I quilt....love and joy and purpose. We honor the work of the quilter when we love and use the quilts they make. Wow - I love that quilt! Because it's being well loved and used, the fabrics are fabulous, the log cabins are fun, and because I can't believe you picked the whole thing apart! I agree it looks better with the sashing - I don't know if I would have had it in me to pick the thing apart - probably would have been sad in the back of a closet. Awesome quilt. Wow - what staying power you have to have unpicked it all. I love it both with and without the sashing! Quilts are meant to be loved and used. Absolutely love the scrapiness. What a happy quilt. The colors and fabrics are intoxicating! You picked just the right quilt to share........it's living up to it's biggest promises...warmth and love ! I love this quilt and you were right , I think to add the sashing. The white gives your eyes a place to rest so you can take in all those great colors and patterns. Aren't quilts that actually get used and loved the best?! Scrap quilts are always my favorite and yours is gorgeous! I can't even imagine ripping out all those seams but your decision to do so was a great one. Good job. 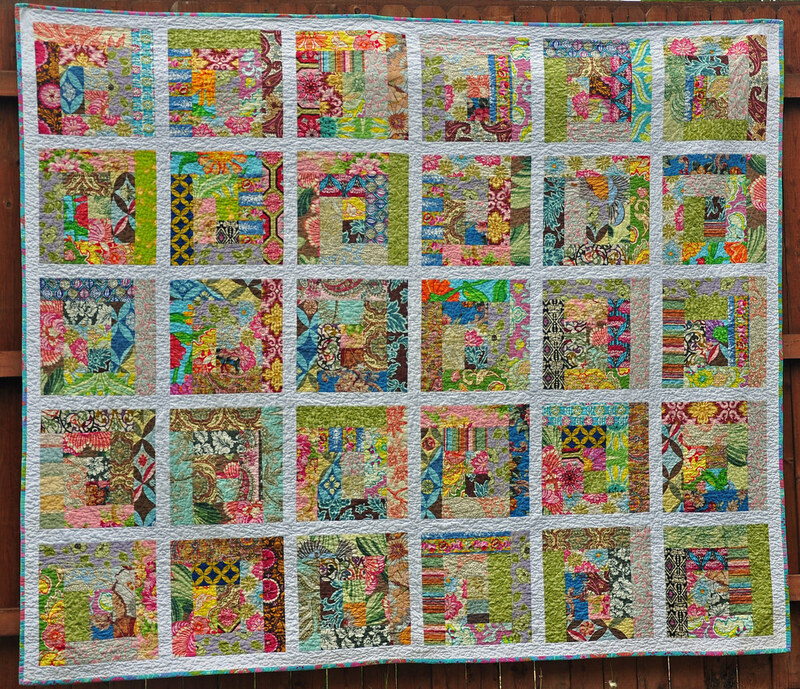 what a great scrap busting quilt! What a pretty quilt! I just finished pulling out all the stitches on a quilt top that I wasn't satisfied with and wondered if anyone else does that...I'm happy I did too! Oh, Melanie, that's one happy quilt! I love this with sashing too and the thought of you unpicking every block apart is mind-boggling! The end result is so beautiful ! This is such a fun quilt! I very much agree that quilts should be loved and used! The white sashing was a great choice here - really makes all those scrappy blocks pop! Fantastic quilt! I'm so glad you decided to add the white sashing - it lets each block stand on its own. It's so nice to hear that a quilt is being "used up." The last picture says it all! Your quilt is so colorful and the white sashing really complements all the beautiful fabrics you used. There's nothing better than a quilt thats loved and used by the whole family - including the dog. Thank you for sharing it with us, too! Love the scrappy look of this log cabin and it definitely looks better with the white sashing. Looks like a very loved quilt in your house. I think scrappy quilts like this last through the years because there are always new favorite spots and fabric combinations to discover! It makes me happy to see a well-loved quilt! This is a beauty. I can't believe you took it apart to add the sashing, but it looks great! I love the sashing and you're right..it definitely "makes" it! What a gorgeous, happy quilt! The white sashing really makes it pop. Beautiful work! You're right--the sashing really makes this quilt work. I love it and the fact that it is used lots is the best part of it. Thanks for sharing. This is so divine! Delicious fabrics galore. Wonderful delight for my eyes. Can you tell I love this? absolutely gorgeous! What a fantastic scrap quilt! Love your quilt! great fabrics! What a happy quilt. I'm glad you took the time to go back and add the sashing... it really makes all of your lovely fabric pop. This is truly a lovely quilt, but what I like best about it is the fact that it is USED enough to get dirty! I absolutely adore that quilt and the fact that it gets used! It is inspiring me to use up my scraps in such a fashion! 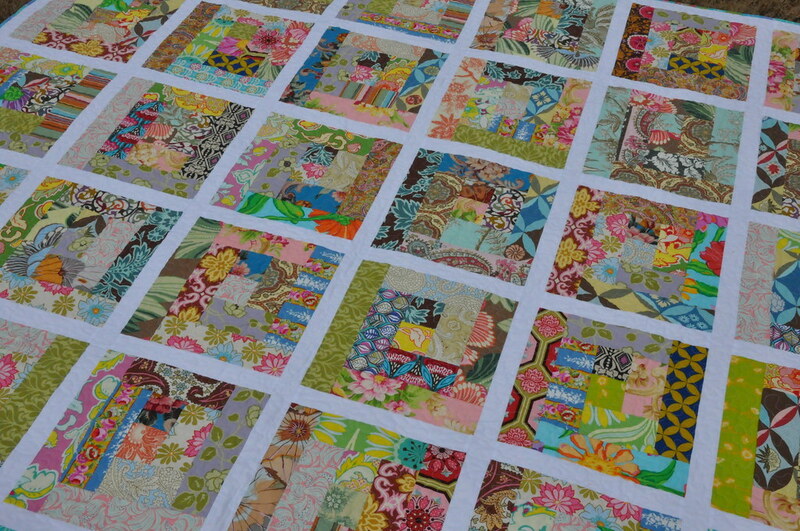 Scrappy quilts are my fave, especially in times where it is wise to reduce, reuse and recycle. Fantabulous! Sew On! Yeah for scrappy quilts that get used! Delightfully scrappy quilt! The white sashing was a stroke of genius. It really shows cases the bright and cheerful blocks. Those really are the best kinds of quilts. it's so pretty! I love the sashing and the individual blocks. Thats a glorious quilt - and the sashing between the blocks gives them more definition. Well done - thanks for sharing! 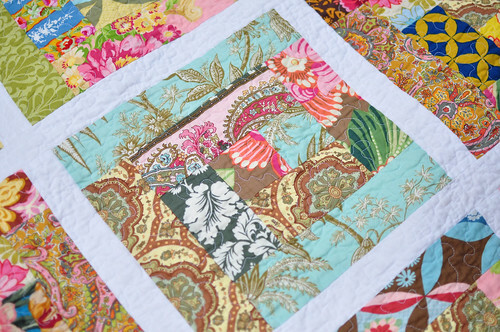 I love log cabin quilts and I really like how the sashing gives definition to the blogs- It was a great solution to all that richness of color. 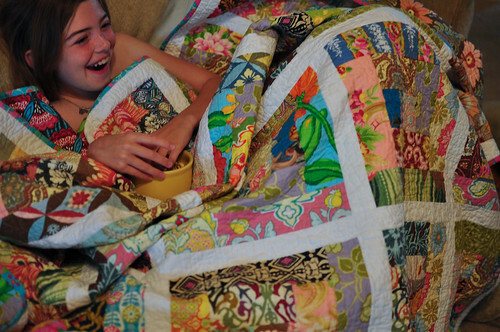 It makes me happy when others use the quilts that I have made- well loved is the best quilt compliment. Enjoy the festival- there are so many terrific quilts to view. That is a lovely quilt! So glad you posted it for the festival. I'm inspired by it to keep on making crumb blocks to put together a similar one for our living room. Can't go wrong with scrappy logcabins-what a cheery bright quilt and the white sashing really makes the logs stand out. Glad you shared before photos. 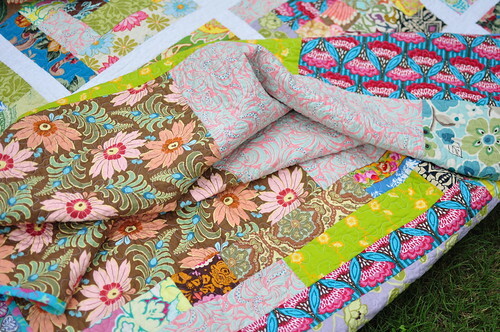 Now that's a perfect quilt - lots of beautiful fabrics and soft enough to crawl under! Very happy looking quilt, great fabrics. Melanie, love your quilt! Had to comment because my name is also Melanie, I grew up in Texas (Austin) and I also have freckles and love quilts!